A medical worker sprays people being discharged from the Island Clinic Ebola treatment center in Monrovia, Liberia, in this September file photo. Ebola has killed more than 4,500 people in West Africa and wreaked havoc on the region, but some Africans see a bright side: The virus has been limited to five countries. It has even been beaten back in two of those countries. They no longer share plates or eat communally in Liberia as was the custom. The generations-old greeting - a handshake and finger snap - has stopped. And some children have been orphaned over adult fears of contracting Ebola. For many in West Africa, Ebola has taken not just lives, but the very way of life. Two Chattanooga natives are working on African Ebola relief efforts -- one working to prevent the disease in Sierra Leone, the other working to curb its long-lasting effects in nearby Liberia. Alexis Decosimo, a Baylor School graduate, is working to help ensure the well-being of the most vulnerable Ebola patients in Liberia -- children. It's one of the countries hardest hit by the deadly disease, and the fear there is palpable. Children suspected of having the disease are kept in isolation. Those with symptoms are quickly separated from those without and are kept in isolation centers. Many of the children have already lost a parent to the disease. Many have watched as others carried away the bodies of dead parents and siblings. Some, left without the protection of parents, were kicked out of their homes by fearful neighbors. Even with no symptoms, children in confinement must go with little human interaction or touch for nearly a month before they can be released. Health-care workers hover in scary-looking protective gear that makes them resemble aliens. Among the survivors, many are raising themselves or being raised by teenage siblings. In recent days, anxiety in America has spiked over a handful of real and suspected Ebola cases on U.S. soil. Meanwhile, at ground zero in West Africa, Ebola continues to spread at nightmarish speeds, mainly in Liberia, Guinea and Sierra Leone. The bodies of at least 4,500 African Ebola victims have been buried or burned since March, according to Oct. 15 figures from the World Health Organization. That's more deaths than in all previous Ebola outbreaks combined. But it's only the beginning. The WHO predicts as many as 10,000 new cases per week by December, with the disease killing seven in 10 victims. Decosimo's organization -- Playing to Live! -- isn't working to contain the illness or treat the sick. It's aimed at addressing the emotional and social needs of the children suspected of having the disease who are kept in isolation. Decosimo, a doctoral student at East Tennessee State University, holds a master's degree in art therapy and clinical counseling. About two years ago, she lived in Liberia for five months. She launched her organization a month ago after the outbreak of Ebola to help improve the quality of life for children stuck in isolation centers. Research shows that children who play and interact with art have a better chance of recovery from diseases, Decosimo said. So her group has created a curriculum for health workers that emphasizes therapeutic play and creativity. "If we can process out that trauma, if we can build those coping skills, the children have a better chance of surviving, thriving and being able to overcome," she said. Playing to Live! is working in a special 20-bed isolation clinic for children. 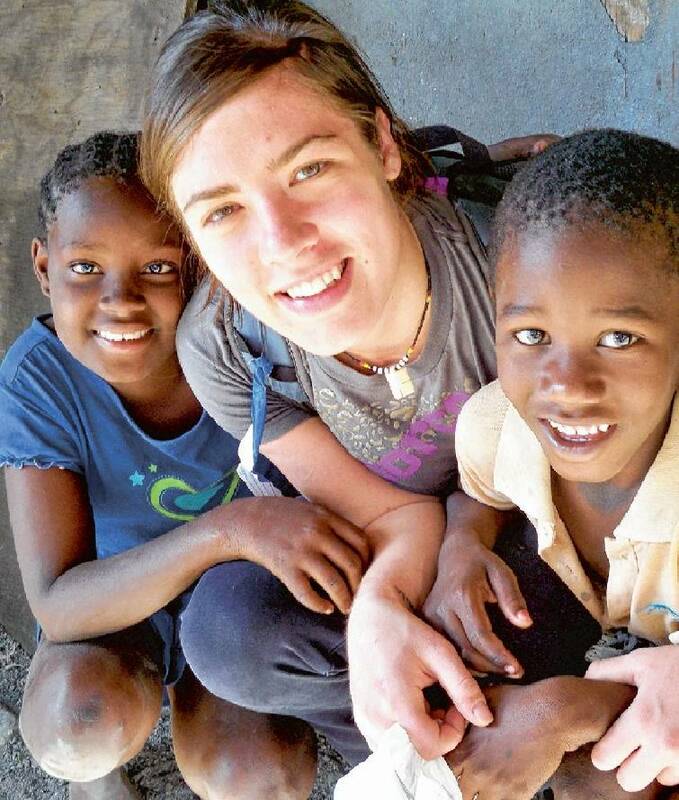 "These children were orphaned and were just left on the street," Decosimo said. Volunteers work directly with the kids and train health workers on how to promote creativity with the patients. They're all based on techniques Decosimo has used in her own art therapy practice. They play a superhero game, creating their own capes and talking about what superpowers they'd like to have. Children draw pictures of their old houses and parents they've lost. "I wish that Ebola will [be] finished in the world," wrote one child. "God bless you." Volunteer Jessi Hanson enters the clinic each day with gloves, long-sleeve shirts and pants. The children still smile, she said, though they are emotionally taxed. "They cannot touch anyone but the survivors who are their hired caregivers in the center," she said. Hanson, who is from Colorado, says the virus needs to be halted in Africa to prevent a worldwide crisis. "African, American, Asian or European, we are all human, and we are all equally susceptible to this virus," she said. "It unites us in a macabre way, and we need to work together internationally to stop it at its heart." A country away, Perry Maddox, a McCallie School graduate and Lookout Mountain native, is working on preventing the disease in Sierra Leone. He's chief operating officer of Restless Development, a program similar to the Peace Corps that helps train young people to be community leaders. After the Ebola outbreak began, the group started working with Sierra Leone nationals on how to respond. Volunteers go door-to-door to teach locals how to avoid the disease, how to quarantine the sick and how to dispose of the dead. Maddox lives in London but was in Africa about six weeks ago. With 300 volunteers on the ground, the organization hopes to educate 360,000 people across Sierra Leone. He said the instructions for containing Ebola are fairly straightforward. What's more more important is learning from someone you trust, he said. "The real trick of this isn't necessarily the content," he said. "The real trick is that you've got to have relationships and you have to understand what communities need and how to talk to people." And this is rural Africa. Some villages have no Internet and news spreads only by word of mouth. "They're getting into some communities where no one has heard of Ebola yet," he said. "It's amazing to imagine given the media attention." But in most of the country, Ebola is omnipresent. It's all that's being talked about. "There is nothing else going on in Sierra Leone aside from Ebola work," Maddox said. "It's pervasive. You feel it everywhere."